Showing each node's creation date but in the content-list (instead on in each node)? 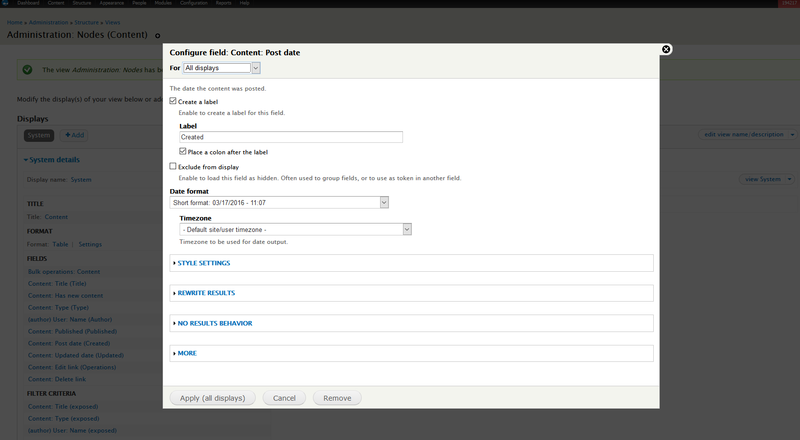 In Drupal 7, we can show nodes' creation date very easily by going to the edit back-end forum, scroll to the lower part of the form, and there add "show node creator and creation time date" (or a similar phrasing). But, AFAICR this does not show creation date for all such nodes in the content list. Is there a way to add a creation date column to the node list in the "content" page of the site? I found a patch that supposed to do so but it seems to have failed testing. I don't mind if the way to solve it is via a module or a codepiece I could implement somewhere with or without further customization. Maybe someone here has a ready solution for this? I believe the purpose of this module Administration Views is exactly what you are asking for. Once you install it, it will allow you to override your "content" page. This way you can add extra columns, sorting and filters to that page, using the Views UI. 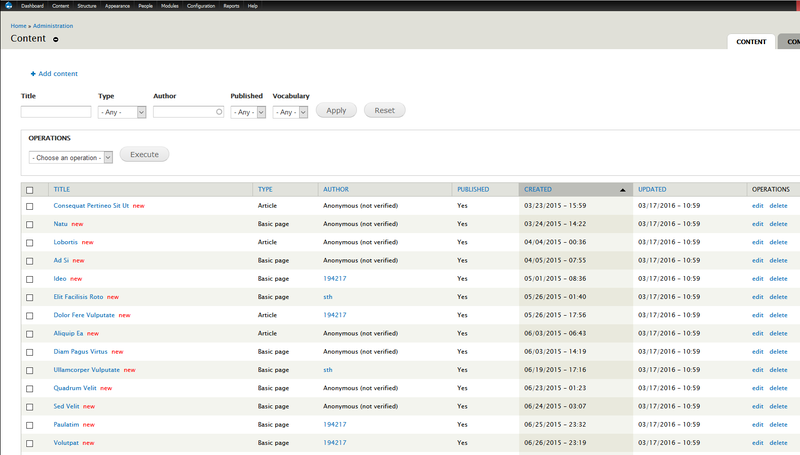 You would need to edit this view, by navigating to the admin/structure/views/view/admin_views_node URL. Configure the new field; set the Date format to "Short" and possible renaming its label to sth like "Created". 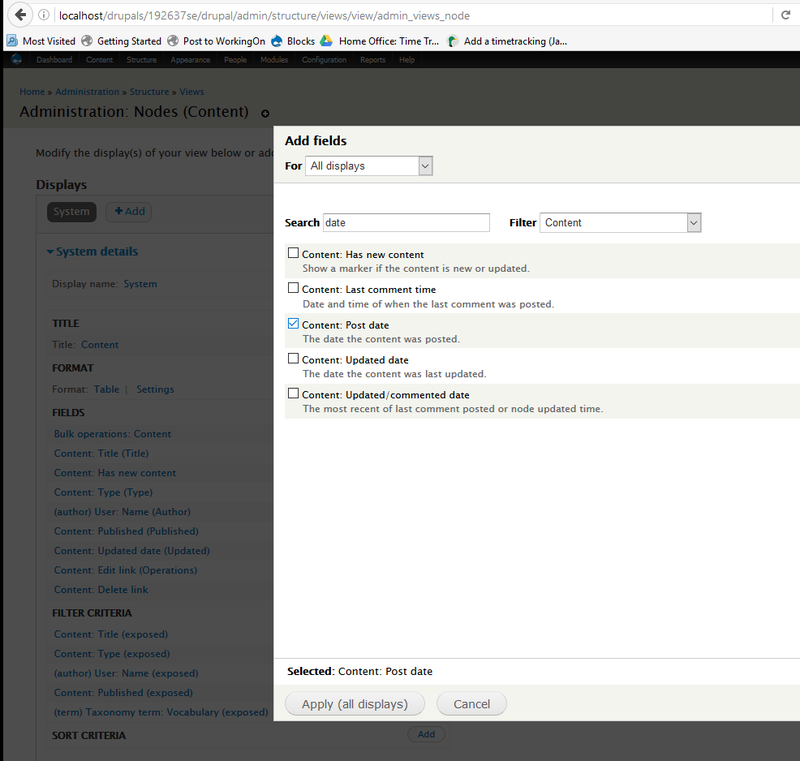 If for some reason you don't want to use the Administration Views module as suggested previously, you can create a View of your content with the field you want. If you use the Views Bulk Operations module, you can also add operations that include the actions you can do on on admin page. Not the answer you're looking for? Browse other questions tagged nodes 7 or ask your own question. How to create a node programmatically in Drupal 7? What is the best choice to create a node through code? Why not programatically created nodes in the simpletests? How to embed “add node” form in a page and retain content-creation permissions? How do I show the publishing date instead of the creation date?